Back on track: Roger Federer. 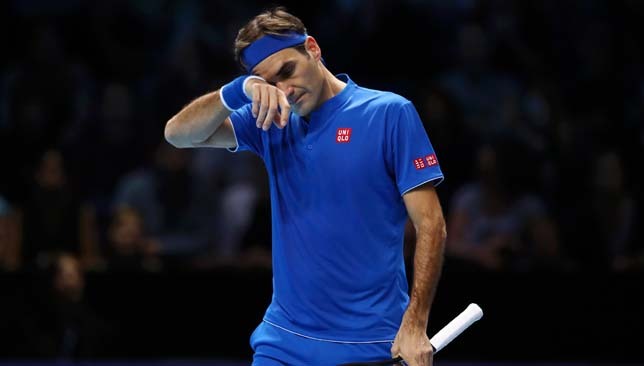 Roger Federer got his ATP Finals campaign back on track with a 6-2, 6-3 drubbing of Dominic Thiem then refused to address claims made by former world No. 25 Julien Benneteau that the Swiss receives preferential treatment at the Australian and US Opens due to his business dealings with the organisations that run them. Federer had lost his opening match to Kei Nishikori on Sunday, then skipped practice on Monday to clear his head – a tactic that paid off for the six-time champion. “I will do the same again tomorrow because it worked. Important was not about my forehand or my backhand or my serve or anything. I guess it was my head. For that sometimes you need a break,” admitted Federer after his win over Thiem. The world No. 3 dropped just six points on his serve throughout the clash and benefited from an error-strewn performance from Thiem, who committed 34 unforced errors in the 66-minute encounter. Federer’s win, along with Kevin Anderson’s 6-0, 6-1 thrashing of Nishikori earlier in the day means that all four players in Group Lleyton Hewitt can still qualify for the semi-finals. Federer was asked if he had any reaction to Benneteau’s claims that were made in an interview with French radio last week. Benneteau told Radio Monte Carlo that there are “disturbing” conflicts of interest that have arisen from Federer’s relationship with Tennis Australia and the USTA, who both co-organise the Laver Cup with Team8, the company Federer co-founded with his long-time agent Tony Godsick. “I don’t [have a reaction],” said Federer. “I know about the comments, yeah. But I don’t really feel the mood during a World Tour Finals to discuss that topic, to be honest. In all fairness, I hope you understand why, because this is a bit of a celebration for tennis. For me it’s the year-end finale. I love playing here. Benneteau pointed out that Federer played 12 of his 14 Australian Open matches in 2018 and 2017 in the prime time slot of 7:30pm on Rod Laver Arena, avoiding the brutal heat players face when they are scheduled earlier in the day. “On the same day, Federer played Jan-Lennard Struff – I have nothing against Struff, great guy – Novak Djokovic played Gael Monfils. We’re agreed that on paper, any tournament director would put Djokovic-Monfils on night session at 7:30 p.m., right? But no. They played at 2:30 p.m., in 104 degrees. And Federer-Struff played at night,” added Benneteau, in quotes reported and translated from French by Tennis.Life. On Tuesday, Australian Open tournament director Craig Tiley released a statement vehemently denying Benneteau’s favoritism claims. “In terms of players and their appeal, it needs to be said that Roger Federer is a once-in-a-generation player widely regarded as one of the biggest ‘box office’ athletes in the world. He has been regularly voted Australia’s favourite athlete,” said Tiley. The Frenchman also claimed that Federer’s agent requested the Swiss not play any matches on the new Louis Armstrong stadium at the US Open this year. Federer played all four of his matches on centre court in New York. “It’s normal that he gets preferential treatment, with everything he’s done. But in some tournaments, there are big differences in the conditions. 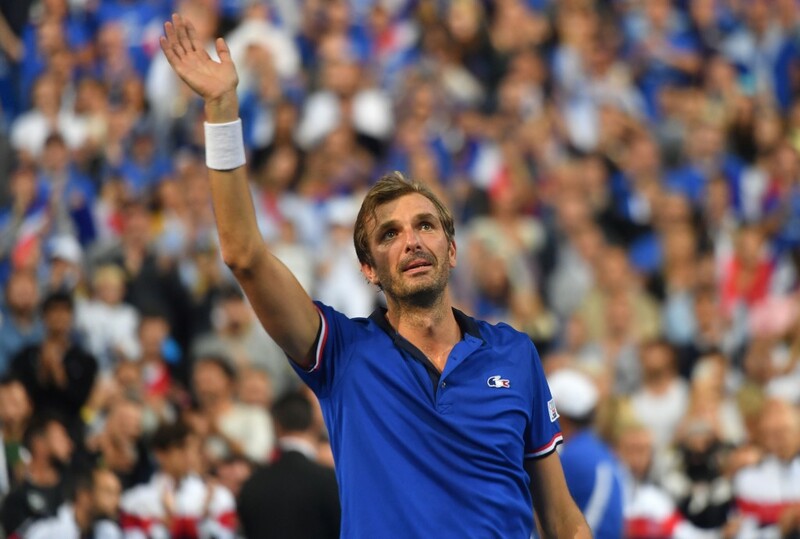 He has no idea what that’s like,” explained Benneteau. Federer was asked if his agent had indeed made such a request to the USTA regarding the Louis Armstrong stadium, or if Godsick normally makes scheduling requests at the Slams. “I get asked, ‘Would you like to play Monday or Tuesday?’ sometimes. Sometimes I get asked, ‘Do you want to play day or night?’ Sometimes they go ask the agent. Sometimes they ask me, you know, Asia wants you to play at night,” said Federer. Both Novak Djokovic and John Isner were asked about the topic at the ATP Finals in London on Monday, and the pair said Federer deserves to be given special treatment. “In a way he deserves the special treatment because he’s six-time champion of Australian Open and arguably the best player ever. If he doesn’t have it, who is going to have it? People want to see him play on the centre court, and they want to see him play in showtime, the best hours, which is 7:30 at night in Rod Laver Arena,” said Djokovic. “I understand Julien’s point because sometimes it does seem that maybe certain players get more favoured year after year in certain tournaments. You kind of have to follow the pattern to really understand whether there is a case or not. Isner echoed Djokovic’s sentiments, adding: “The top players, they sell the most tickets therefore they should get the most. That’s what I think. So I don’t think there’s a favoritism system like that at all. I think those guys are the ones that by and large carry our sport in a big way and they deserve everything they’ve ever earned. “So again, if anything, they may be should get more special treatment because those guys, the top players, have made other players below them a lot of money. It is like the Tiger Woods effect in golf. So that is how you can look at a guy like Roger. He is men’s tennis in my opinion. So, he deserves everything and more that he’s ever had,” said the American. 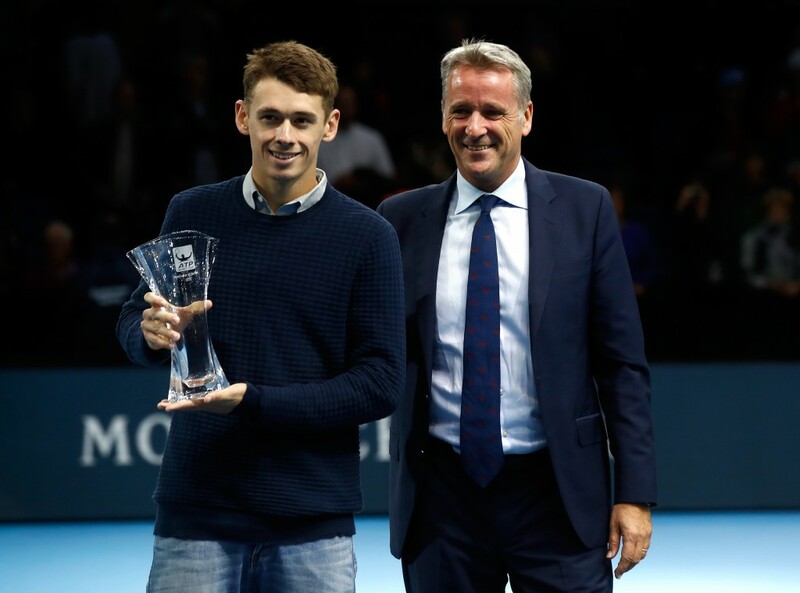 He’s one of the breakout stars on the men’s tour this season and on Tuesday, he received the ATP Newcomer of the Year award on centre court at the O2 Arena in London. Australian Alex de Minaur rocketed up the rankings from outside the top-200 in January, to his current position of 31, and the 19-year-old is undoubtedly one of the most exciting young prospects on the circuit. He was runner-up at the Next Gen ATP Finals tournament in Milan last week, to Stefanos Tsitsipas, and is arguably one of the fastest-moving players on tour. “It’s funny. When I was a kid I had very big feet and I felt very clumsy out on the tennis court. I think once I was able to grow into my shoes, then the coordination and all the different aspects came together. My movement probably wasn’t there until maybe three or four years ago, that’s when it started to click,” De Minaur told a small group of reporters in London on Tuesday. In town to receive his award and to take some ATP University classes, De Minaur’s offseason will see him go home to Alicante, Spain to get his driver’s license, before heading to Melbourne, Australia for his preseason training. At 183cm, De Minaur is one of the shorter players belonging to the ‘Next Gen’ group that includes towering figures like Tsitsipas, Alexander Zverev and Taylor Fritz. The Aussie teen joked with the 193cm Fritz in Milan that he would give him some of his speed in exchange for a few centrimetres of height. It was all just banter though as De Minaur insists he is confident in both his game and abilities. “No,” he firmly says when asked if he’d trade his speed for being taller with a bigger serve. Sport360 caught up with De Minaur in Milan earlier this month to discuss his remarkable 2018. You started the year ranked 208 in the world and now you’re No. 31. Did you expect something like this would happen this season? Not at all. It’s been an incredible year for highs and things are never expected. I’ve really just enjoyed every second of it. It’s a pleasure to be able to compete at this level and play some great tennis throughout the whole year and I’m looking forward to what’s to come. Your first month of the year was incredible, making the semis in Brisbane and the final in Sydney. What was that period like for you and did it help prepare you for what came next during the season? The Australian summer was just insane. The support I got was incredible. There’s nothing better than playing at home, with your home support. It’s probably the best way I could have started the year. From then on I’ve tried to take that momentum and that self-belief and take it the whole year. Can you try to describe what it felt like going through all these experiences at home? It’s just incredible, everything about it. Being able to make a final where I grew up in Sydney with all my family and friends watching me, that was one of the best experiences out there. And then later on I made my Davis Cup debut, which was always a dream for me and probably one of my proudest moments ‘til this day. The MC introduced you earlier as the Australian No. 1, how does that sound to you? It’s another thing I never expected. I played some serious tennis and I really owe it all to the other Aussie players. They’ve helped me grow and believe in myself and play some good tennis. I think Australian tennis at the moment is in a good spot. We’ve got four guys in the top-40 and we all want the best for each other and we keep pushing each other, we watch each other play, train with each other and it’s just a great environment. You’re Australian, your father is Uruguayan, your mother is Spanish, and you spent a lot of time between Spain and Australia, how do you feel your multi-cultural background has influenced you? Obviously I went back and forth from Aus and Spain a lot and I feel I was able to grab the best things out of both worlds. I’ve learnt a lot from being in Aus, and a lot from being in Spain and I think it’s definitely helped me be the player and person I am right now. So what are some of the best things from both worlds? You get the hard-working qualities from one part, then being able to relax and get your mind off things. Tennis is a very mind-consuming sport so you’ve got to learn when to switch off and when to switch on. You get to work with Lleyton Hewitt, alongside your coach Adolfo Gutierrez. What would be the thing Lleyton has helped you with the most? I think probably the biggest thing is just belief. Belief in myself, in my game, that I belong there playing against these top guys on the tour. Do you have any specific goals for yourself moving forward? I’ve never been one of those guys, I like to take things day by day and see where it takes me. Enjoy the ride and get better each day. That’s always been my motto and I’m going to keep it that way. You mentioned your fellow Aussie players, what’s the vibe like between all of you guys? We’re all great friends. The camaraderie there is between Australian players is great. Recently I’ve had a lot to deal with Johnny Millman and he’s helped me out a lot. He’s one of the most hard-working guys out there and he deserves everything in the world and more. He’s sort of helping me out, trying to be more professional. Just different aspects. Obviously he’s got a bit more experience than me, so I’m enjoying the ride and always trying to learn. We talk about your speed a lot, and how it’s one of your biggest strengths. Have you ever timed yourself over 100m? I can’t say I have. I’ve never really done track and field at all. The only other time I can remember is probably doing 400m laps, just as fitness. But I’ve never really timed myself. 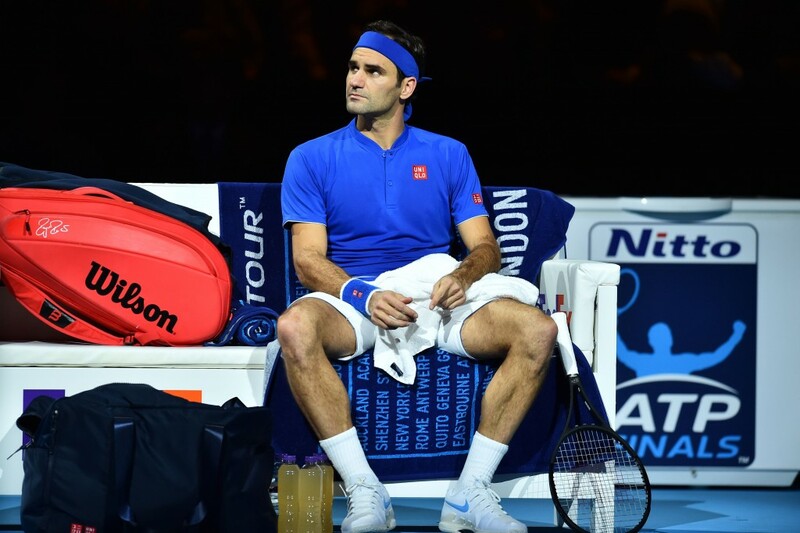 Roger Federer insists he is feeling no extra pressure to perform at tournaments despite playing a relatively curtailed schedule for the past couple of seasons. The Swiss world No. 3, who fell to Kei Nishikori in his ATP Finals opener on Sunday in London, has contested 13 tournaments in 2018, and 12 in 2017, compared to 17 events in each of the seasons from 2012 to 2015. At 37, Federer has become more and more meticulous with his scheduling, and has opted out of playing the clay season altogether in 2017 and 2018. He hasn’t competed at the French Open since 2015. A winner of a men’s record 20 Grand Slam titles, Federer started this season with a stunning 17-0 win-loss record — a stretch that saw him return to the world No. 1 spot in February, becoming the oldest to occupy that position in the 45-year history of the ATP rankings. He is 21-6 since the start of Wimbledon though, falling in the quarter-finals at the All England Club to Kevin Anderson, and losing to John Millman in the fourth round of the US Open. While his season remains a highly successful one, Federer acknowledges that it was never going to be like his impressive 2017, that saw him pick up seven titles, including two Slams, and lose just five matches all year. Asked if he felt a different kind of pressure nowadays at tournaments compared to when he was playing a fuller schedule, Federer said: “I used to play exactly this schedule for about 15 years, this last second part of the season. It’s just that the clay has been less. Other than that, I don’t see a major difference. “I want to do well at every tournament. I think fans know that. Tournament directors know that. I know it. My team knows it. “I don’t think, per se, I’m playing worse because of it. I think I’ve had that pressure not going out early most of my career. Once I became world No. 1 anyways. Once you’ve been a former world No. 1, you always have that for the rest of your career, for every guy. 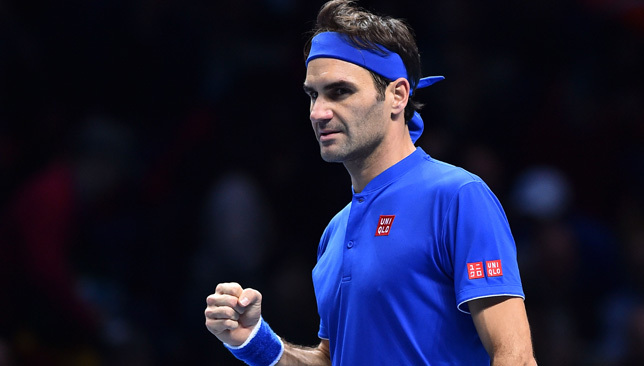 Federer is targeting the 100th title of his career this week at the ATP Finals at the O2 Arena in London, and next takes on Dominic Thiem in a crucial round-robin clash on Tuesday. “We haven’t played in a while, I don’t remember when that was the last time [I played Thiem]. I mean, okay, whatever. I haven’t thought about the match, to be honest. I haven’t had enough time. I wasn’t even thinking who I’m going to play next. I just know I need to do better than today. That’s pretty much it,” Federer said after his loss to Nishikori on Sunday. Thiem is one of just three active players to have a positive head-to-head record against Federer (the Austrian is 2-1 against him), but they haven’t played in over two years and the Swiss won their sole previous meeting on hard courts. Thiem is making his third consecutive appearance at the ATP Finals, and lost his opening match against Kevin Anderson in straight sets on Sunday.